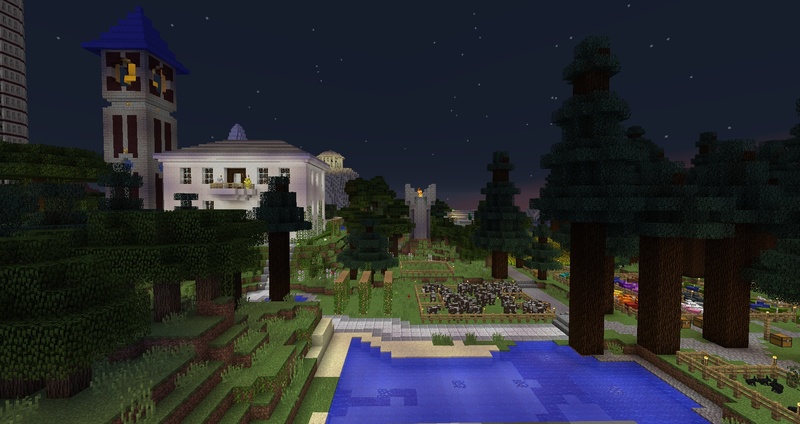 Over the past two-and-a-half years or so I have been keeping a persistent Minecraft world on my home computer. 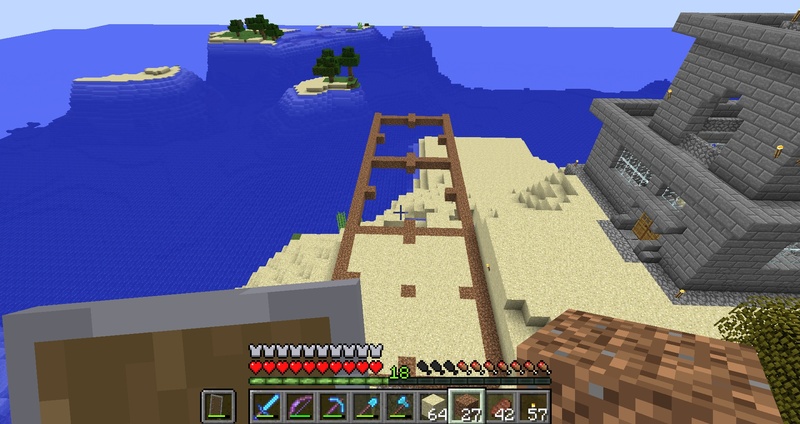 Every now and then I’ll start up the server and delve into my little Minecraft world of a couple of weeks or months. Every time I do I invite a couple of friends to continue their own creations. 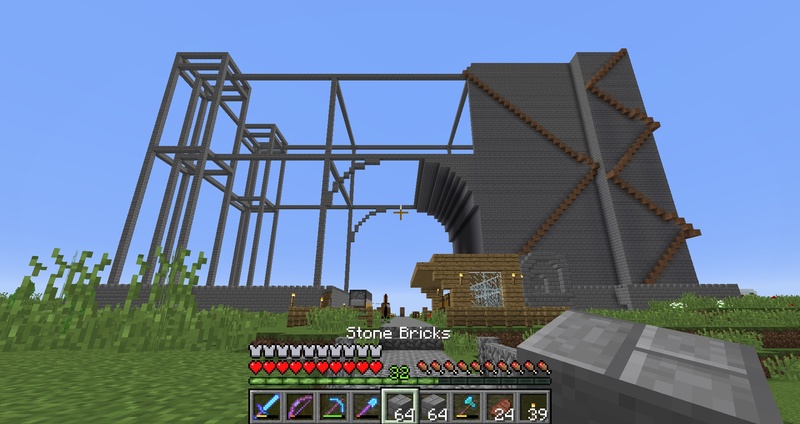 It’s been a while since I last played Minecraft, but I recently started up the server again and have been hard at work creating new structures. 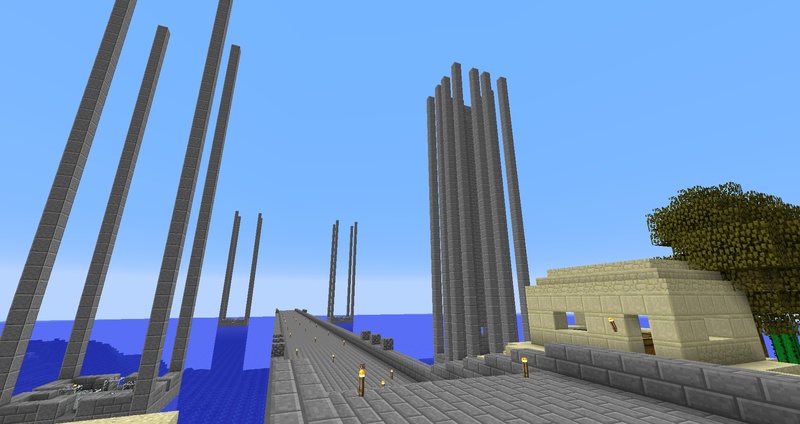 The World’s Tallest Tower (center) – a cylindrical tower that reaches the maximum height allowed in the game. The Great Southern Wall (center-right) – a giant wall which was constructed to keep the civilized lands safe from the desert to the south. 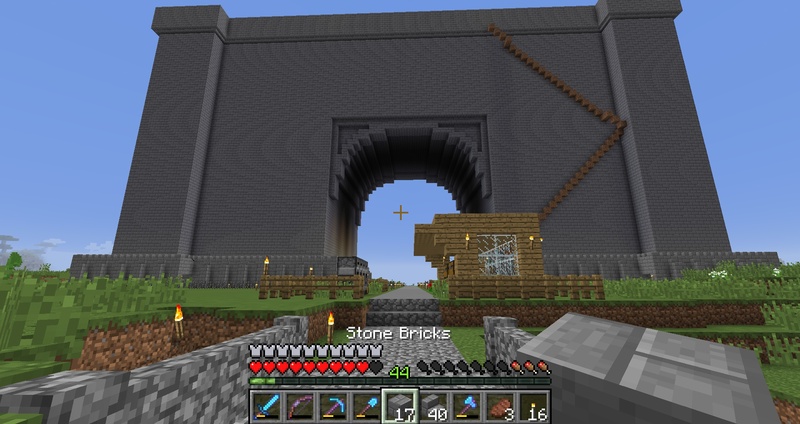 Just FYI, I build this wall before I even heard of Game of Thrones, so, no, I wasn’t copying it. The Great Warehouse (right) – a sprawling warehouse filled with racks and racks of chest. 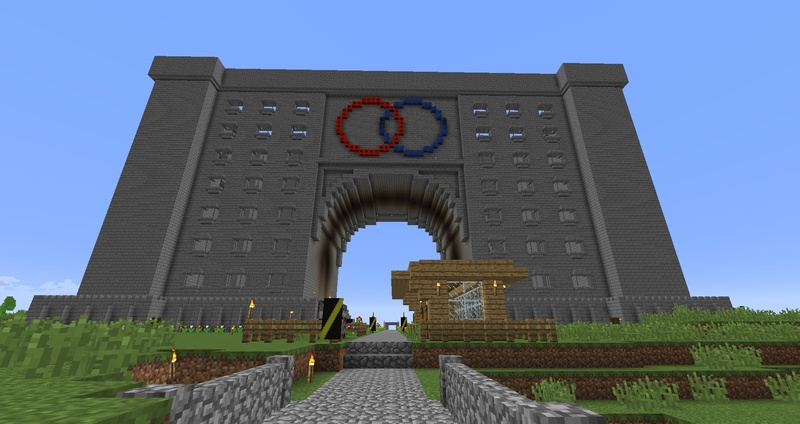 I was inspired to build this when the fourth Indiana Jones movie was announced. 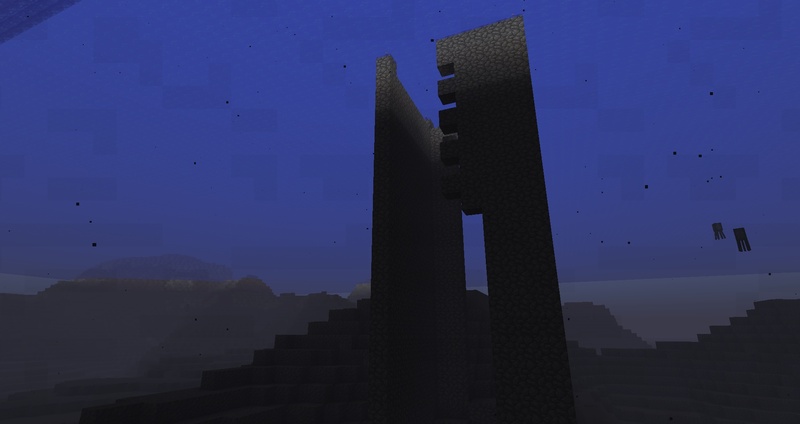 The Obsidian Tower (upper-right) – a tower made of obsidian, built by one of my friends. It is not quite complete. The Missile Silo (center) – a large ICBM sits in the southern end of civilized lands, ready to inflict mutually assured destruction against any nuclear enemies. 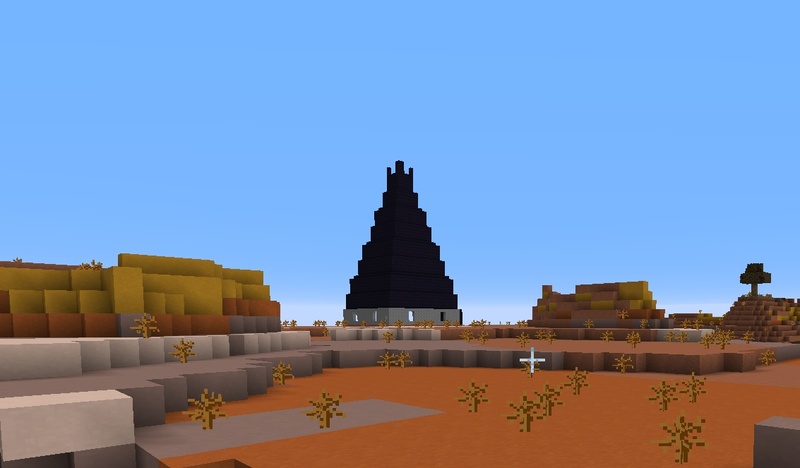 The Black Pyramid (center-bottom) – a black pyramid constructed of netherbrick. The interior is completely dark and acts as a sort of arena for killing monsters should the need for special materials only dropped by them arise. 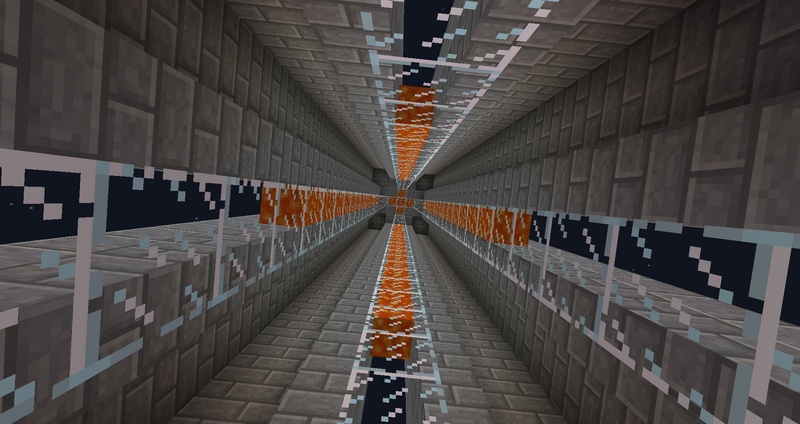 There are many other individual structures too numerous to list, and there are extensive networks of underground tunnels and spaces which are not easily viewed. One of the earliest creations was a village containing a variety of smaller buildings. 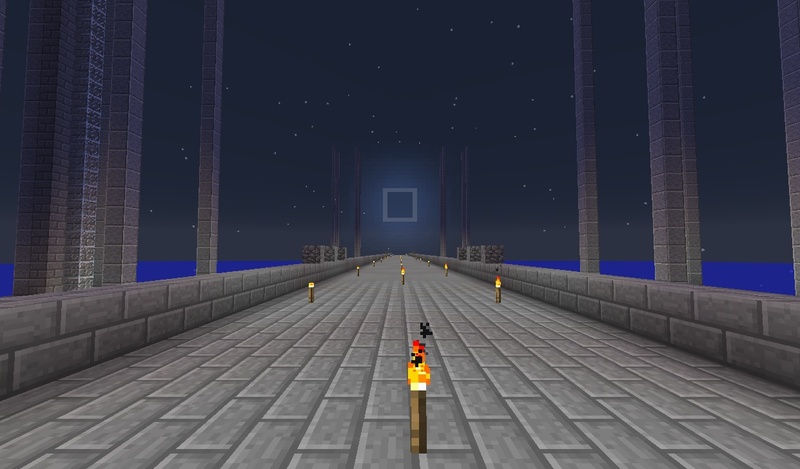 One of the many bridges situated along The Great Road — an absurdly long road I’ve worked on which stretches out far to the East. 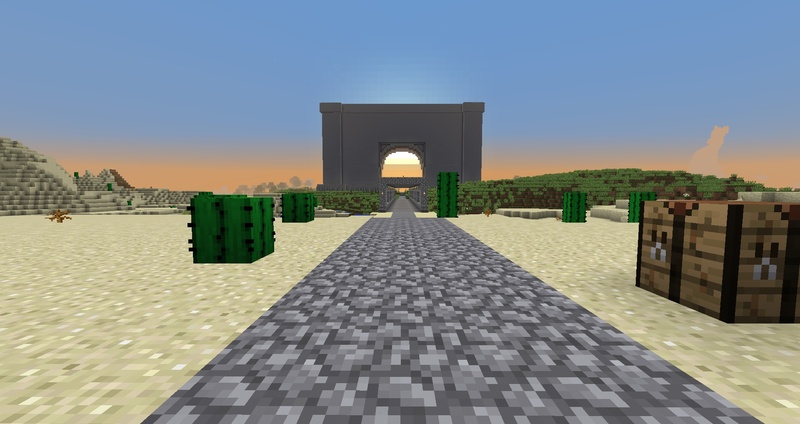 The Great Road features many beautiful views. 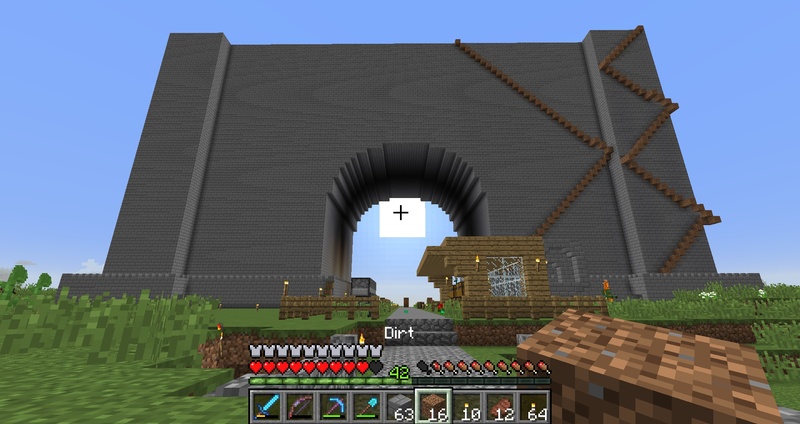 The view from the rear of my main home base. The Black Castle is perched atop a distant mountain, silently menacing the surrounding lands. A cozy chalet along The Great Road. 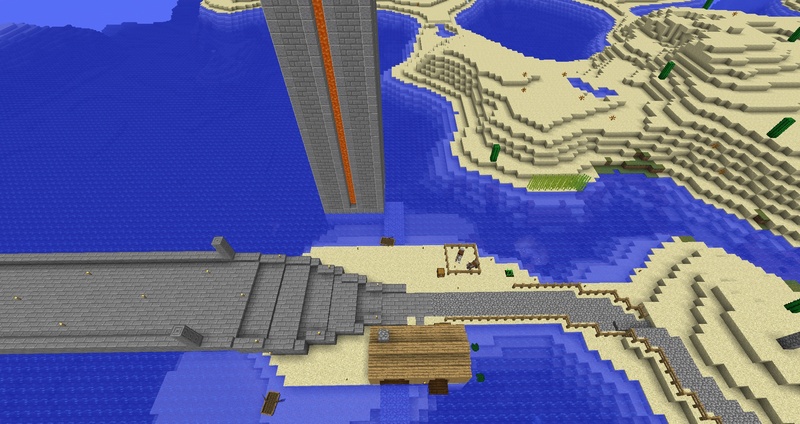 A coastal desert fortress constructed by one of my friends. One of my friends is currently constructing a giant statue made to look like the humanoid characters in the game. An admittedly poor view of Little Egypt which lies immediately south-east of my main home base. 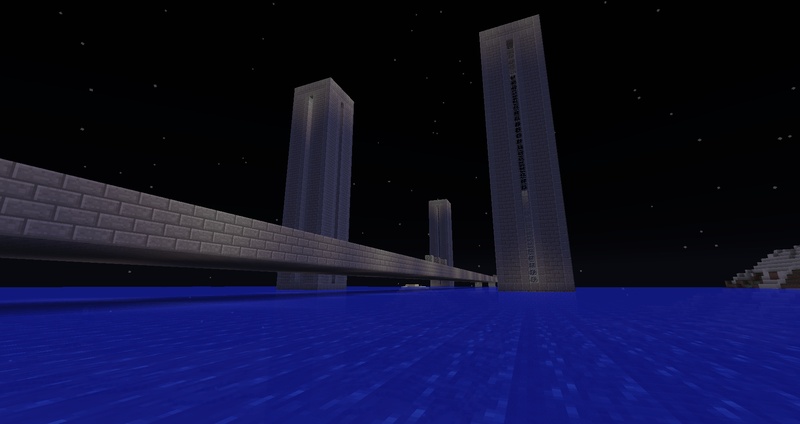 A view of the rear of my mansion. 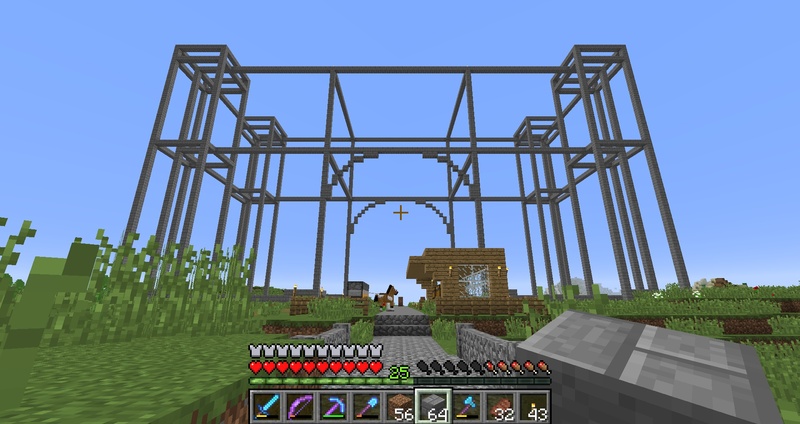 There are many animal pens and a good deal of farmland near my mansion which were built for resource gathering. 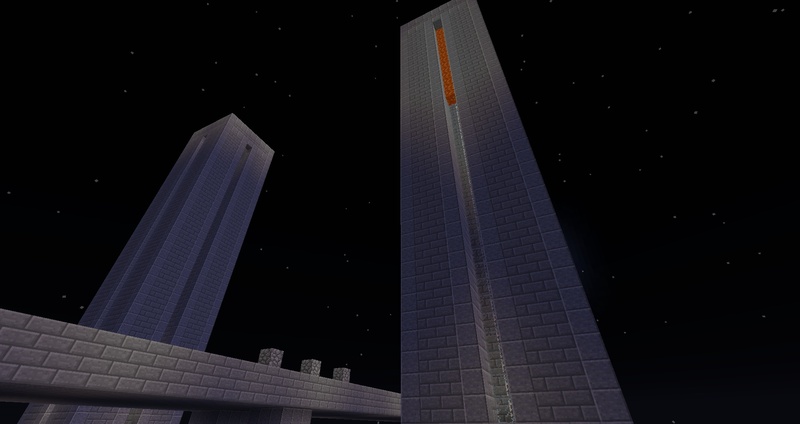 The bell tower on the left was a copy of a similar tower I saw photos of online. 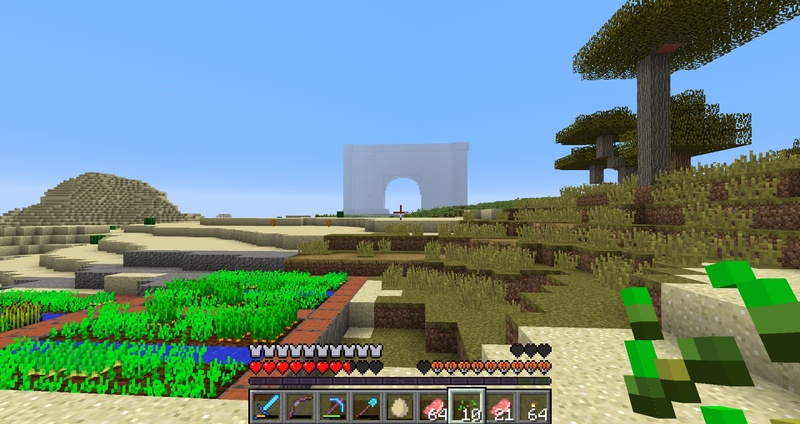 In the distance you can see the Portal Temple, which was the site of the world’s first portal to the Nether. 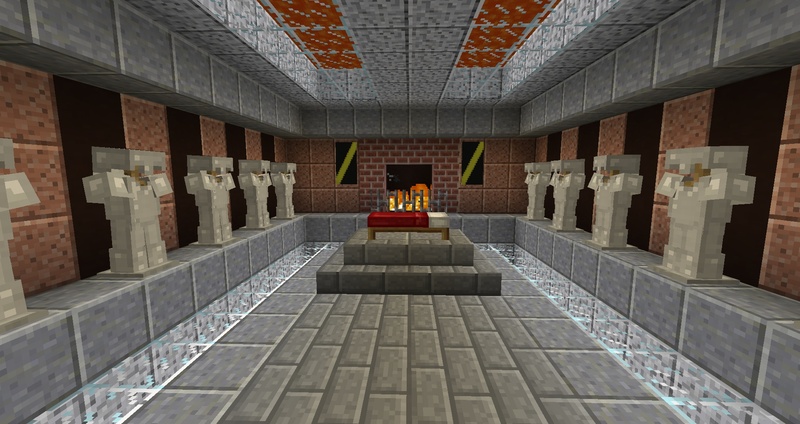 A statue created as a tribute to all miners. This was constructed at the mouth of one of the many mines along The Great Road which were struck for the stone needed for its construction. I mentioned earlier a “Great Road”. 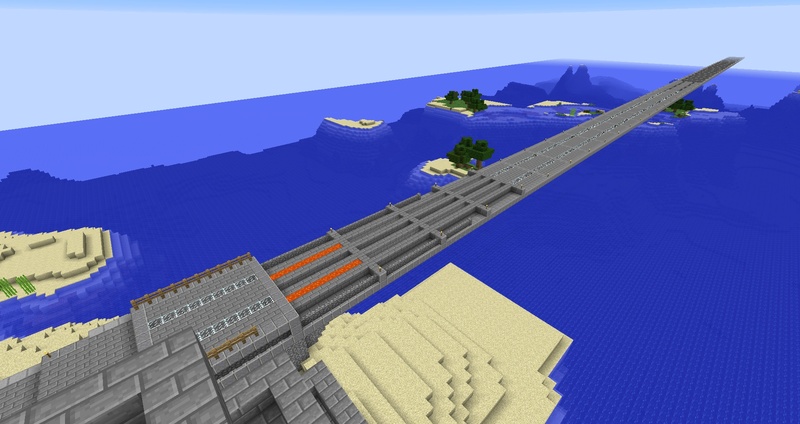 This is a project in the world where I have created a long, east-west running road across the Minecraft world. The last time I measured, it took about half an hour to walk from one end to the other. This “Great Road” begins at the eastern coast of the area where everything started and runs westward. 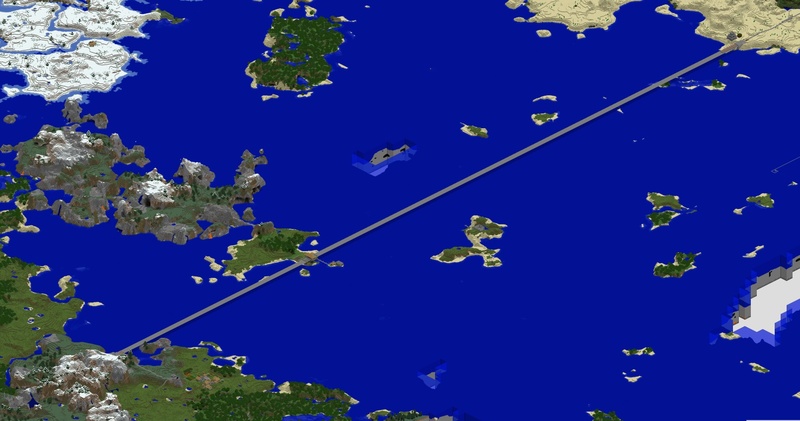 During this most recent return to Minecraft, a new megaproject was started in which The Great Road was to advance to the west, across the ocean. 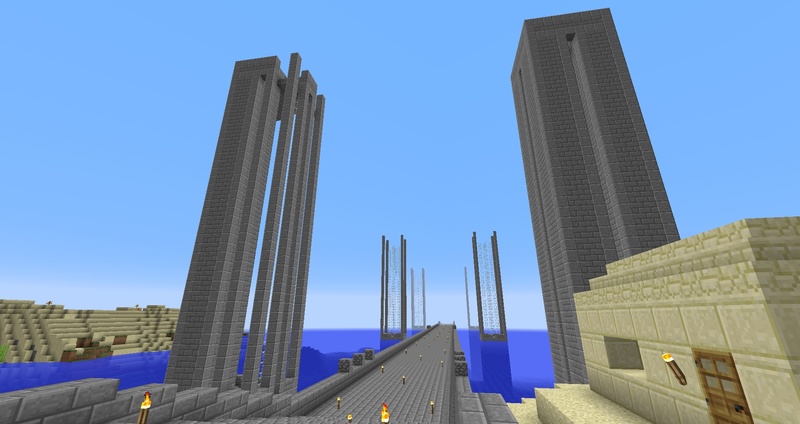 The Great Bridge to the West will be the largest structure in the world once it is complete. 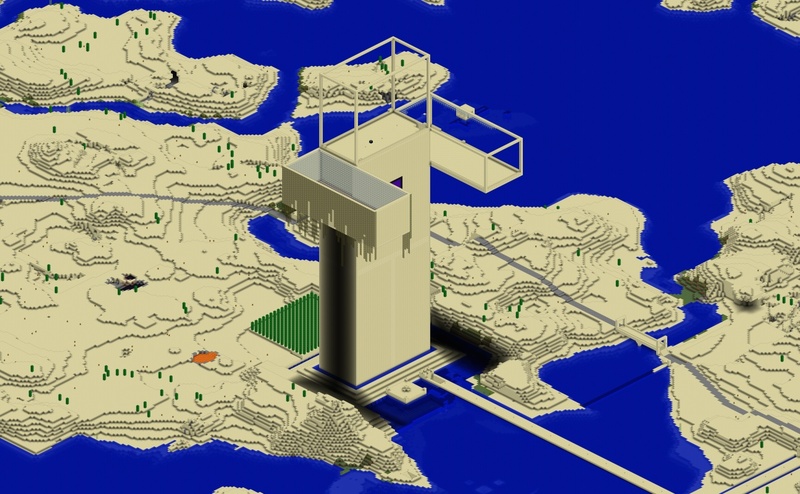 It’s beginnings are visible in the lower-left corner of the overworld map near the start of this post. 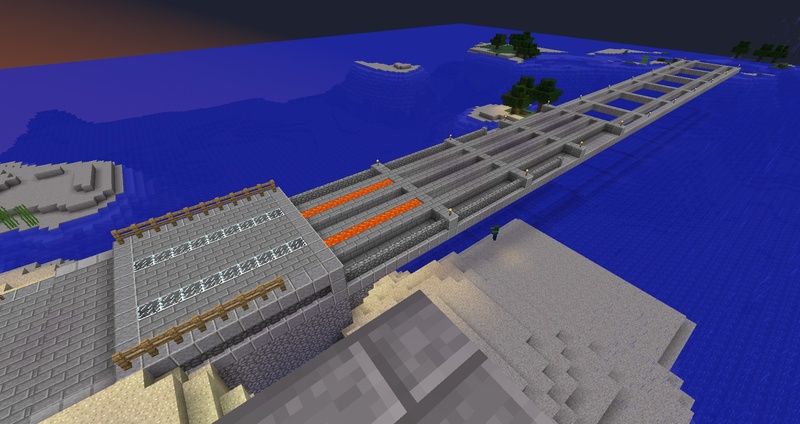 You can get a feel for how long the bridge is from the following image. 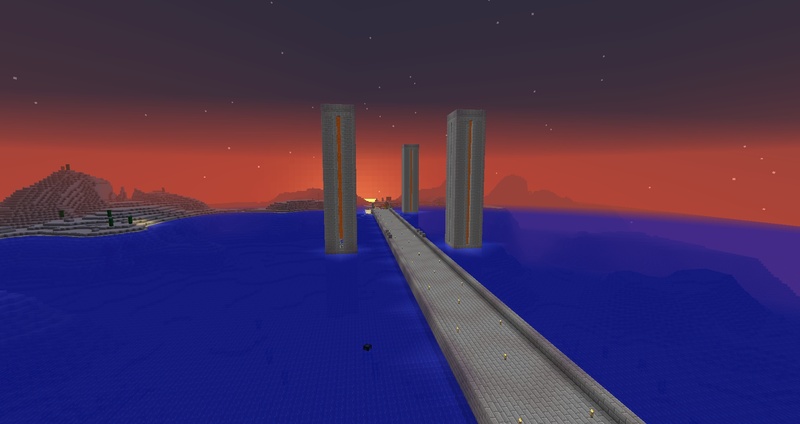 Here we see much of the known world, and The Great Bridge to the West is in its initial stages, reaching only 3/4s of its planned final length. 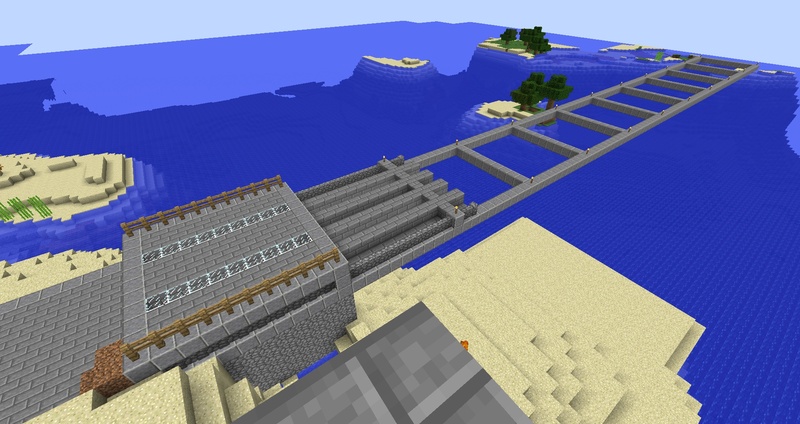 Initial planning the east landing and overall bridge superstructure. 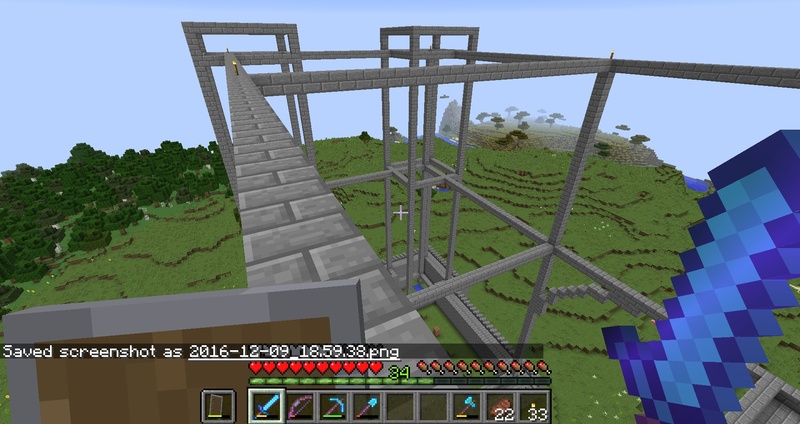 I decided I wanted the bridge to made up of repeating segments in order to break up the monotony of building a bridge that was identical along its entire length and to give it some aesthetic character. After a couple of refinements I settled on an acceptable segment design. Here we see the construction of the eastern abutment and the prototype superstructure segment template. 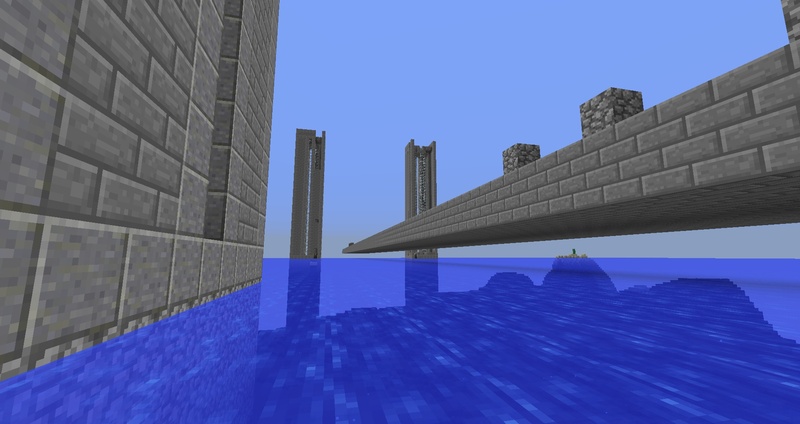 Initial preliminary construction of three bridge superstructure segments depicting the three layers of each segment. 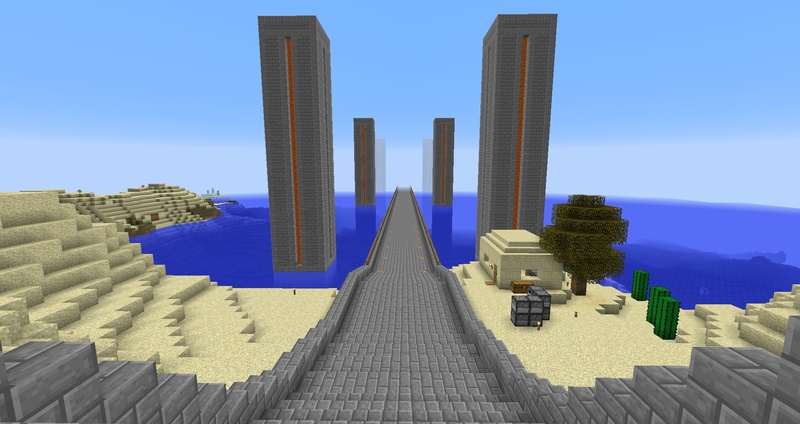 My friend, being a little overzealous, started creating bridge segments right away. 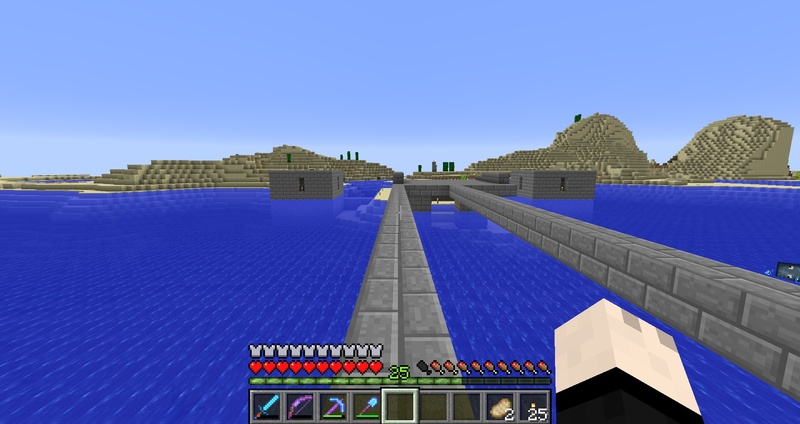 What I wanted to do first was to just have the three progressively completed segments to act as a guide, and to first create a skeleton of the bridge spanning the entire length of the ocean before building the superstructure segments on top of it, layer by layer. An overview of the bridge’s initial progress. 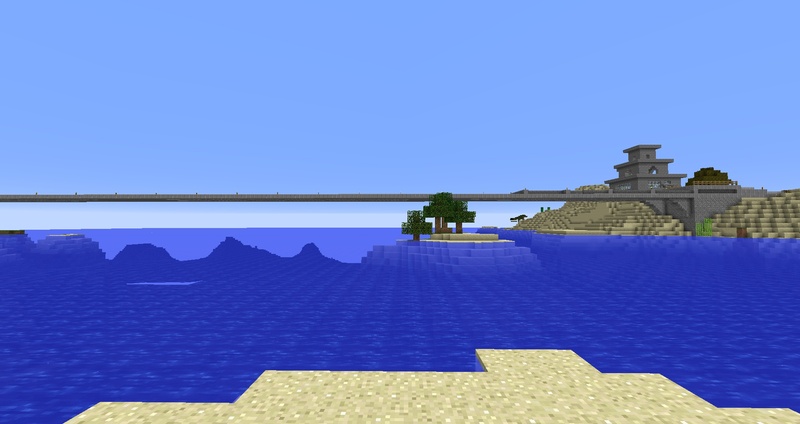 Construction of the bridge skeleton is temporarily halted when it hits a good-sized island. 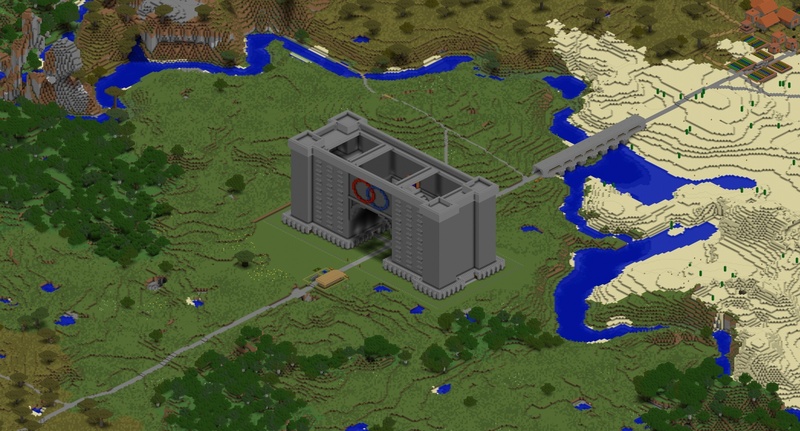 A small base of operations was set up on this island. 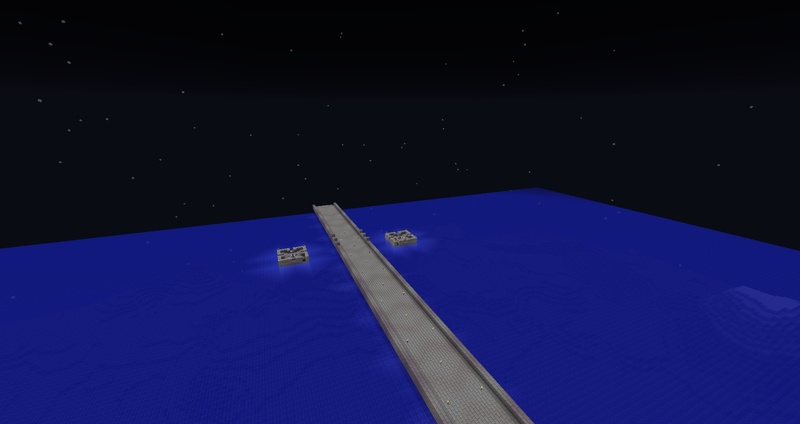 The skeleton reaches across the entire ocean. 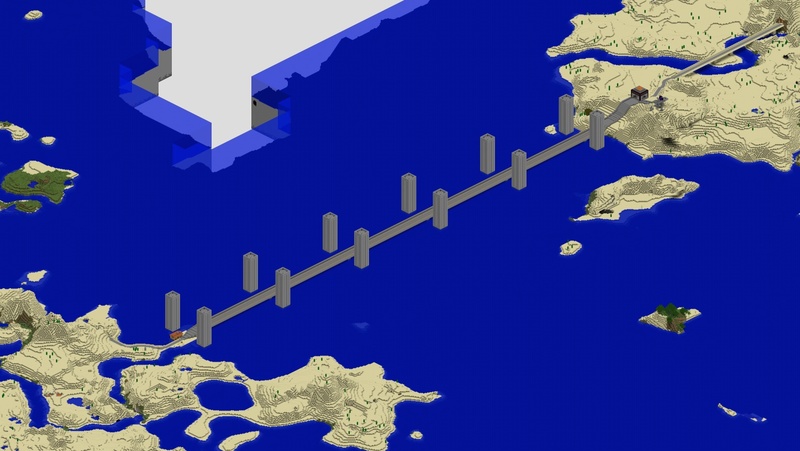 Without the segments filled in it is easier to count how many segments span the entire ocean. I planned to use this information to design additional support structures for the bridge (e.g. pillars, suspension towers, etc) but I’m not 100% what I will do (if anything). 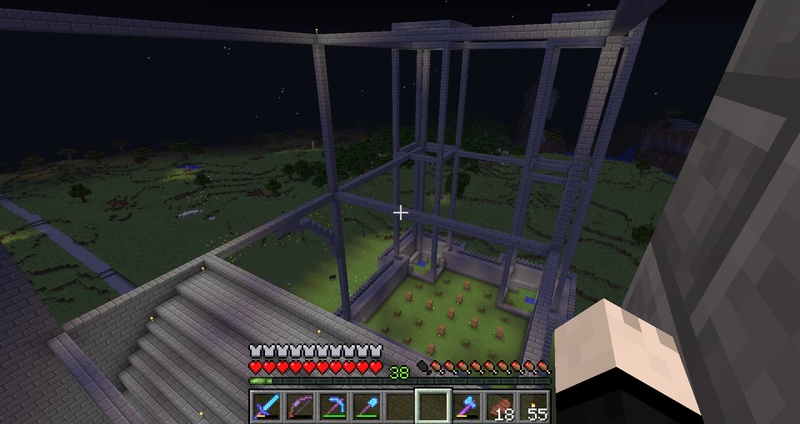 The first layer of the superstructure is complete. 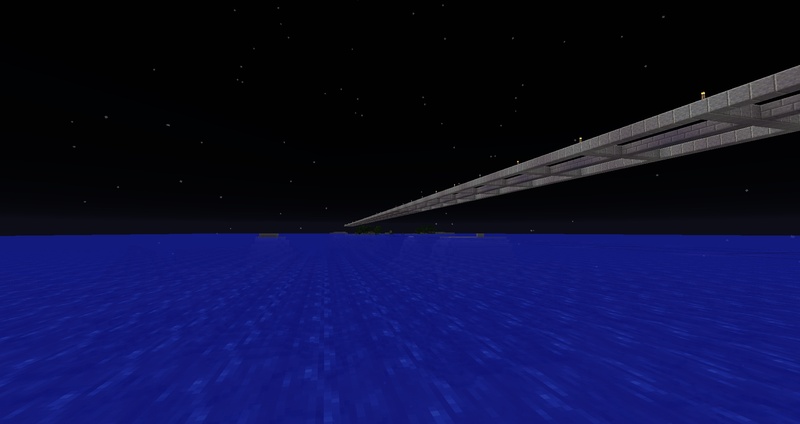 The skeleton of the bridge without the segments completed continues off into the night. 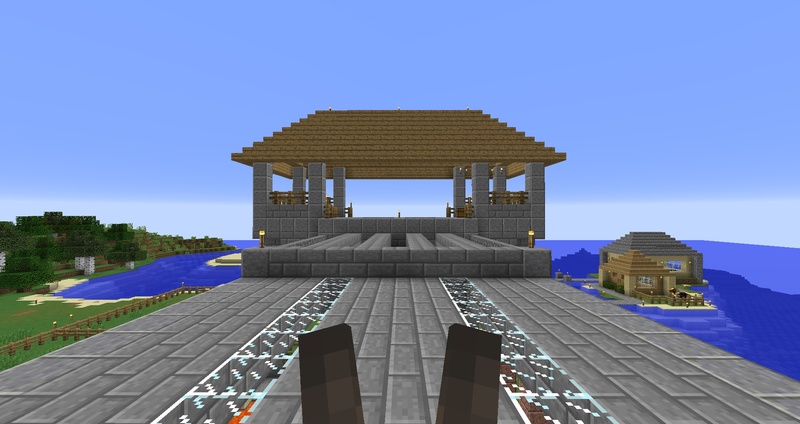 With the skeleton complete, the meat starts being added, one layer at a time across the entire span of the bridge. Side view of the eastern end of the bridge. 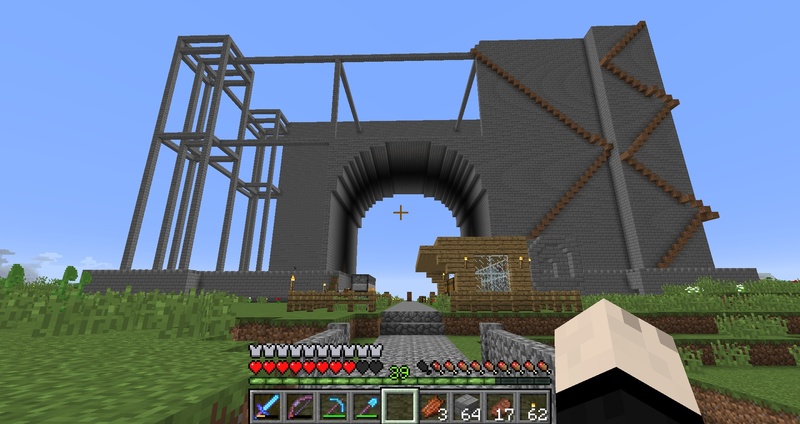 The building on the shore covers the entrance to the mine used to gather materials for the bridge and includes storage and smelting facilities. A depot was built along the bridge at the point where the large island that interrupts it. 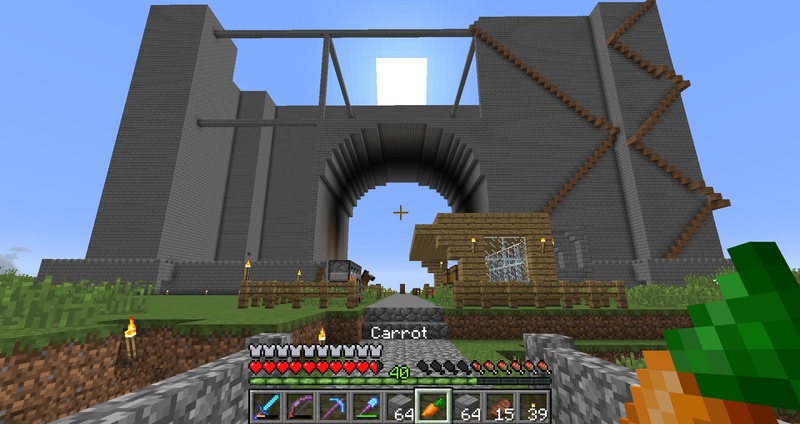 Beneath the depot are some buildings, farms, and a mine. 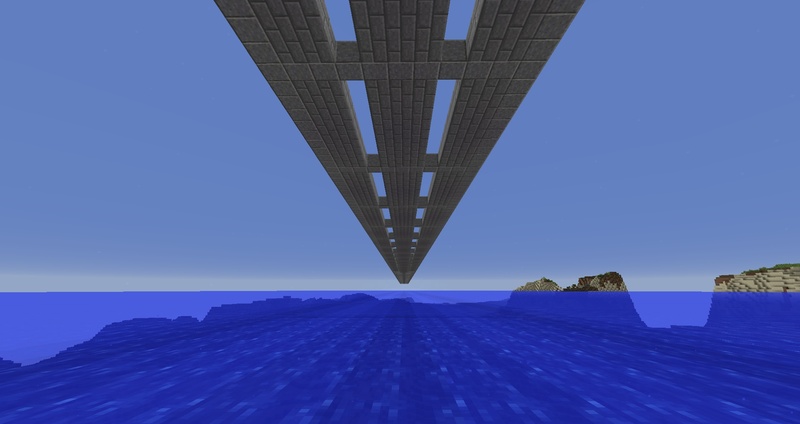 Prior to this particular megaproject (which my friends are helping me on) there was another megaproject in which a bridge across a sea far to the east was built. This bridge — known as The Great Bridge to the East — was, at the time, the largest structure in the world. 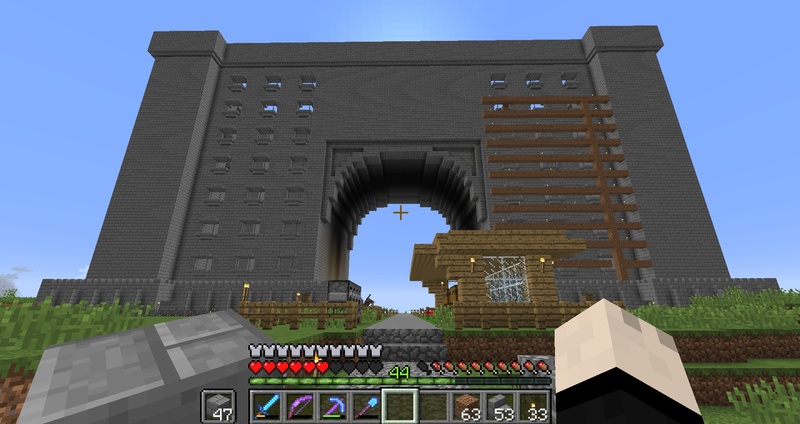 Another megaproject in the world is the East Gate.